UoA Design 4 Group participating in the SKYRISE City competition held by the Auckland Architecture Weekend 2010. We, The Triangle Collective, is a group of 3 students studying Architecture at the University of Auckland who are participating in the annual Auckland Architecture Weekend 2010 competition- SKYRISE city. The event will be held on 16th October 2010 in Sheds 1+2 on 135 Halsey Street, Auckland CBD. The competition brief is to design a 8m tall skyrise with a 2m x 2m square footprint at the bottom. Our Design 4 group brief is Recasting, where we have to recast an everyday material and put it into an environment that we will not normally associate the material to. The blog is to note down important sessions, crits and experiments throughout our design process from the beginning to the night of the event. Hope you enjoy the project as much as we do. Working very hard for the past few days, we are trying to get our tubes done as quickly as possible. We got told on fri that our health and safety officer will be seeing us on monday to see whether we can actually make our structure on the night. If it's too dangerous, they can cancel our participation. We really need some sponsorship from v's.. going through at least 1 a day for the past week and we think we've grown immune to caffine to fight fatigue. Posting at 2.30 am isn't fun. Need to sleep now. Goodnight. WOAH ~ 10 days left! and our group is starting to get desparate and stressed. Working everyday, sewing, cutting, measuring, thinking, hastily trying to finish in time for the competition. We cant believe how well we can work under time pressure, no time wasting at all. Our project is still 2D, flat on the ground so we dont even know if it will work. It should. It has to. Hopefully it will be done by the end of the week so we have time to fix problems. Our working bay is becoming a mess. Using long strips of wood to measure and tape the triangle size of the blanket. We need to do 48 of these modules. Laying out our module on the ground. Its actually bigger than we thought. different piles of tubes- need to cut and sew. need to sew connections. finished sewing. For the past week, we've been working at Tamaki every single day. After finishing a 1:1 prototype of the tube structure, as shown from the previous post, we have started on making the final thing. Net showing the structure and names of each parts. 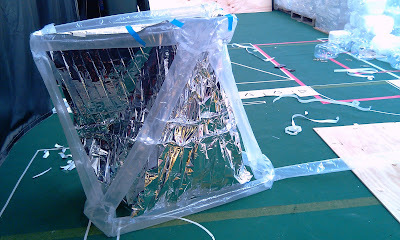 This net is the final design of the module. the top 8 levels consists of 6 triangles with base 2m and height 1m. The last level is more complicated to fit into a square base from a triangular prism at the top. This is to make more space to hide our blowers and lighting. Emergency blankets will be sewn over each of the seams, cladding it and hiding the tubes. The different connections between each tubes. We made laser cut templates that we traced over. layout of our module on the ground. It's actually quite big. We used masking tape to make a seam line for the sewing to follow. After several days, we finally finished our rough 1:1 tubic form of our structure. This size of section was originally planned to be placed in the middle, but we realised it will be tough to have a changing module of different triangular shapes. Thus we will be keeping it simple to one isoceles triangle module- 2m base width, 1m height. Uni started again so we haven't had much time to upload on to our blog. - For the second half of the semeseter our whole design group has moved to Tamaki Campus for more space and room to build our 1:1 skyrise. - Our group has been looking for more sponsorship and wants to thanks 3M for their generosity and big help with double sided tape. - We also want to thankyou Flexilight NZ for their generous offer and discounts with our lighting samples. - Right now we are trying to test out how to make a net for the inflated tubes so the whole design becomes an integral module and not separate. Tamaki Group space Masked Plan Door Masked Table and Toilet Plans Light samples from Flexi Lights Air Blower for Bouncy Castle 2HP 3M double sided tape Sewing plastic tubes. Thanks Ming for lending us your sewing machine! Thanks for your support @ The Triangle Collective ! After a week's break from design, we started working on our project again. Through out this period we have been constantly looking for sponsors to help out with the costs for our project. We made a 1:10 model of our skyrise and used a hair dryer to inflate the model. We found out that unfortunately, even though we had sewn pieces of triangular emergency blankets together, the shaped would not be kept when it is inflated and becomes cylindrical because there isn't a backbone structure for the tensegrity- prism shape. Also because the blanket material is so light, it cannot stand upright by itself. We might need to slot in sand bags at the bottom to make it more heavier. Here are some exterior and interior photos of the model with fairy lights inserted inside. The space is not dark enough to create and intensifying effect, but we can still see spots of the LED bulbs like fireflies. 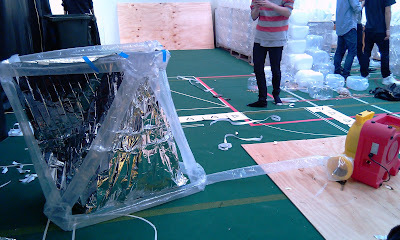 So to keep the tensegrity shape we are going to use a structure of continuous inflatable tubes to act as a backbone. The emergency blanket will still be sewn on to each sides so the model still looks similar, except the strips of white fabric will be inflated into tubes instead of the whole volume so that people can still go inside and not let the air leak out. We need to test out whether we can insert the fairylights or ropelights into the tubes and also have air blown in to inflate. We are looking at Panda Blowers like the ones used for jumpy castles, and also clear polythene plastic for the tubes instead of the white fabric. We'll have more testing soon once semester break is over. Facebook Group + Event. Click to Attend ! The Triangle Collective. Simple theme. Powered by Blogger.